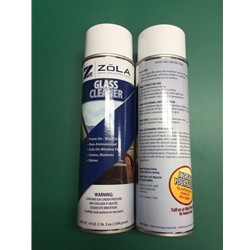 "BETTER THAN A BUSINESS CARD"
This glass cleaner is sold on our website for $6.25 each, but as you can see below in the program details, your per can cost of this cleaner with your label attached is cheap enough to be given away to your good customers or for when a customer upgrades to a higher profit item or to help resolve a customer service issue. 2. The labels can be printed in 4 color process to your design specifications. 3. Your price per can with your custom label is $2.80 (20 cases X 12 cans/case=240 cans.) 240 cans X $2.80 = 672.00 plus shipping & handling. 5. It takes approximately 3-4 weeks from approval of your artwork until you receive the product.